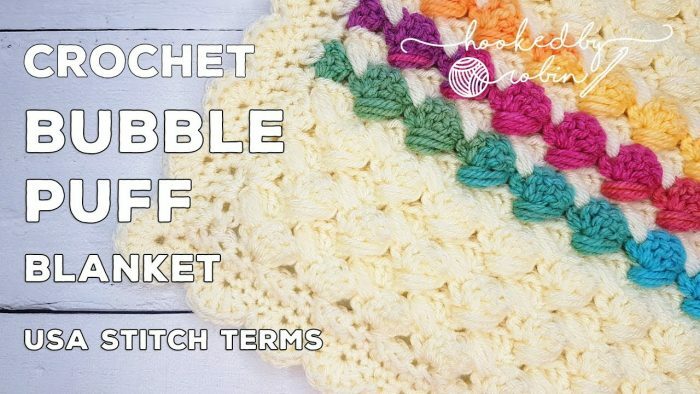 Learn how to crochet this perfectly designed bubble puff blanket using a free crochet pattern with the step by step video tutorials. Previously, we have already brought you free crochet patterns for some of the most eye-catching, elegant and comfortable crochet blankets. Now it’s time to move on and learn how to work up one more alluring and colorful blanket in the best possible way. This time we will be crocheting one of my favorite blankets I’ve ever seen or made during the nine years of practice. If you are a fan of texture, chunky fat stitches, fast growing projects, and stunning yarn then this project is just perfect for you. All you wiil need is to get together your yarn and hooks, follow the written instructions and start creating this gorgeous blanket. I hope you will love and enjoy crocheting this lovely blanket as much as I did. Good luck and happy hooking! Crochet along with me to make your very own Bubble Puff Blanket. This beautiful, super soft, squishy blanket is bursting with texture – combining shell stitches and puff stitches.